Dr. Ahsan's Web Lounge: What is this Place! 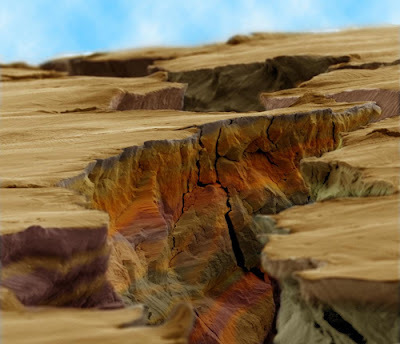 Looking like Grand Canyon, its actually a microscopic crack on the surface of steel, which was created due its bending. This image won the first prize in 2011 FEI Owner Image Contest. It was photographed by Martina Dienstleder of the Austrian Centre for Electron Microscopy and Nanoanalysis in Graz. Her colleague, Manuel Paller then coloured the image with rusty tones and added a cloud-dotted sky to complete the look.